I noticed this sign at a dinner today. Looks like it is real! HawaiiO and RaginPlainsman like this. JAL???=???????? | ??????? | JAL????? And we get the better Lie Flat Sky Suites! Short article in the Seattle Times for those of us who can't read that press release. 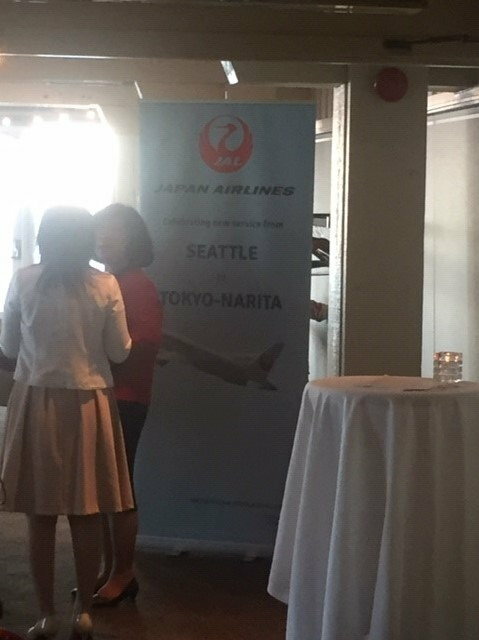 "The new daily service on Boeing 787-8 aircraft will leave Narita airport each day at 6 p.m. and, because of the time shift, arrive at 11 a.m. in Seattle the same day after a 9-hour flight. Flights from Seattle will leave at 2:20 p.m. and arrive in Tokyo at 4:30 p.m. the next day." Seems like a new config will be deployed to the NRT-SEA as per the press conference. PE (total 35 seats) on rows 17-21 will be eliminated and will only be a 2-Class config on SkySuite (APEX) while Y would still stay 8-abreast. JAL will do reconfig work on some existing 10 SS8 frames according to the report. It will be interesting to just have Business and Economy (though a good Economy). I'm hoping that with the competition from SEA-NRT (Delta, ANA, JAL), we will see some pricing wars. Maybe even a sub-$400 ticket from time to time. Also, did I read some place that it will switch to HND sometime in the future? New slots at Haneda will be decided next year for 2020 implementation and JL might apply for it but then it depends if it will be approved by J-Gov or not so we'll see. 156 Y and 38 J does not really leave spaxe for the APEX suite. The original NEO version had 144 Y, so it would need a full row plus two half a row some where, yet the 38 seat APEX cabin takes more space than the NEO cabin. So I would guess it it would be the reverse herringbone sky suites that will come to these routes. Because the NEO config has no PY cabin so it gives a good indication of what that space that gives in terms of extra Y seats. I know galley and lavatory are located differently as well. But since the can get the same number of rows from 45 and back wards on the SS version and the NEO version, NEO is a good reference point to understand how many Y seats go there. but the space needed for SS seats aren’t the same. E01 is actually a closer reference. The C cabin goes all the way to mid wing just like SS8. I will still minus a few rows from that though. But since the can get the same number of rows from 45 and back wards on the SS version and the NEO version, NEO is a good reference point to understand how many Y seats go there. So is the added pitch in SS Y mostly from slimlined seats then? It looks from the seatmaps on JAL's site that SS Y stretches back just slight further at Row 55 (along with adding a row in the center section with the bulkhead pushed forward).